While my orchard harvests are not ready for prime time availability and farmstand sales, I do like to share my findings in what I think are some of the best apples I grow. And by best apples, I mean, tree varieties that aren’t too fussy and grow fruit of exceptional quality and flavor. While an apple tree takes several years to establish itself and begin to produce fruit, I’m confident the following varieties are winners both in vigor, taste and culinary use. There are so many really great apples to grow, do a little research for your growing zone, dig a big hole and plant yourself firmly in growing something special. And if space is an issue, plant trees with a dwarfing root stock. I have plenty more apples where these came from, so stay tuned as other varieties prove themselves in my Pacific Northwest orchard. I’ll happily share my findings, in the name of apple lovers everywhere. And please know, there are hundreds of great apples to grow; so I’d love to hear about your favorite apple cultivars. Belle de Boskoop apple: I would have planted this tree merely for its name (pronounced Bell-da-boss-k0e), but lucky for me it’s an all-around great apple with lots of personality. Wonderfully tart, the flavor is unique as if you spritzed lemon juice on it. Belle de Boskoop bakes and cooks well, and is perfect for chunky applesauce, sturdy pies, bubbling crisps, and juicy grunts. In my orchard the tree produces biennially, that is bumper crops one year and little to no fruit the following year. It’s such a delicious, spritely, all-purpose apple that I have no trouble accepting that. The Belle de Boskoop skin brings on a beautiful rosy blush when ripe. Bramley’s Seedling apple is hands down one of my favorite baking apples. It’s a tree that says, Stand back, I’m ready to grow some great cooking apples and plenty of them.” (Yes, I speak apple.) Such a very heavy producer, Bramley’s Seedling usually requires support stakes to keep the overloaded limbs from breaking. Apples are big, firm, crisp and flavorful–spirited for sure, and perfect for cooking or eating fresh though on the uber-tart side when first picked. My tree has proven to be a biennial producer, but again, the apples are so good, I can indeed live with that. Calville Blanc tastes as good as it sounds. 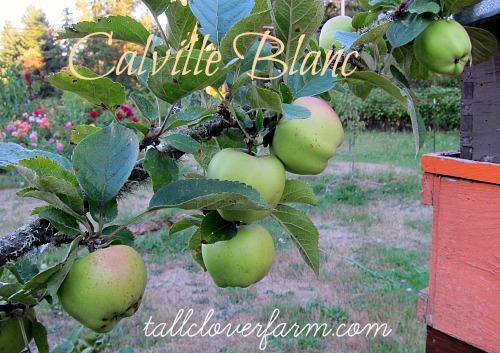 A French heirloom apple dating back to the sixteenth century, Calville Blanc has proven itself as a truly exceptional apple blessed with every attribute you’d want in an apple: it’s sweet, spicy, flavorful, and good in the kitchen and on the table. If that’s not enough for you, this apple contains more Vitamin C than an orange. In my orchard, I’ve found it to be healthy and productive, but in drought years like 2015, Calville Blanc really suffered and produced smallish fruit of lesser quality. So watering is important with this one. 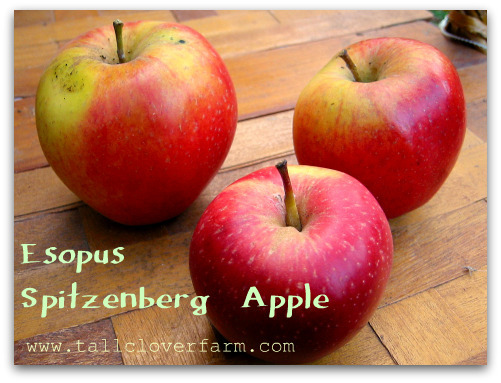 After reading that Esopus Spitzenberg was the preferred apple of Thomas Jefferson, I sought the cultivar out and planted it faster than I could say or spell, “Monticello.” Trees of Antiquity nursery describes the apple glowingly. “Unexcelled in flavor or quality, the fruit is great off the tree, but flavor radically improves in storage. Medium apple with crisp, yellow skin covered with inconspicuous red stripes and russet freckles. Flesh is tinged yellow, firm, aromatic, and complex in flavor; a perfect balance between sharp and sweet. ” I wholeheartedly agree. It took my tree a couple years to get established, and while many sources cite Esopus Spitzenberg apple trees are susceptible to a number of diseases, I have not found that to be the case in my Puget Sound orchard (knock on apple wood). Hudson’s Gem originally hails from Oregon, a chance discovery in 1931. Purported to be the largest russeted apple, the fruit is everything an apple should be: crunchy, juicy, sweet, and satisfying. The disease-resistant tree is vigorous, and insects seem to stay away from the curry-colored beauty. Jonagold is an amazingly good all-purpose apple. In fact, if I could only plant a couple apple trees, Jonagold would top the list. 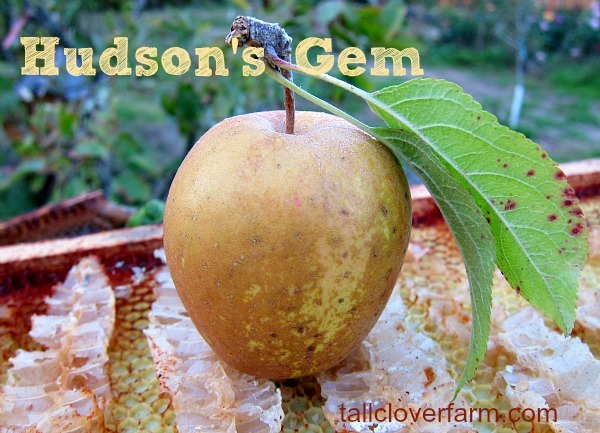 As a cross between a Gold Delicious and Jonathan, it brings a lot of flavor to the table. . Fresh eating or all-purpose, this apple is juicy and super sweet but finishes off with a very nice tartness. The vigorous tree is a heavy and consistent producer of medium to large apples each year. Karmijn de Sonnaville enjoys a Jekyll – Hyde personality, currying interest (and favor) as being both sweet and tart. In fact, at Washington State University taste-test trials, the apple was rated as both the sweetest and tartest tasting apple out of a 100 cultivars. A good keeper, the apple changes personality as it ripens in cold storage, mellowing to further sweetness while remaining crisp. My Karmijn seems to be a bit of a biennial producer, but grows well in a cool climate like in its homeland, The Netherlands, and in my homeland, the Puget Sound Basin of Washington State. If that’s not enough, Karmijn keeps well on the tree and in cold storage. 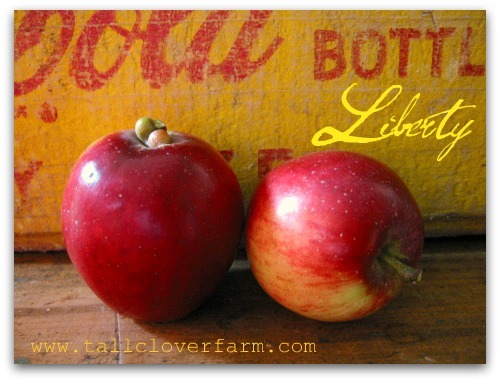 Liberty apple: I joke, “Give me Liberty or give me pests!” as this delicious sweet-tart snacking gem is wonderfully disease resitant, making the Liberty apple a fuss-free choice for the home and organic gardener. Known for its reliability and excellent quality, the Liberty shines on all levels and performs well in our cool climate. If not thinned the apples are small, but like I said, this makes them a perfect snack size. I’ve found drought conditions are no friend to the Liberty apple; this year mine were the size of crabapples, but still delicious. 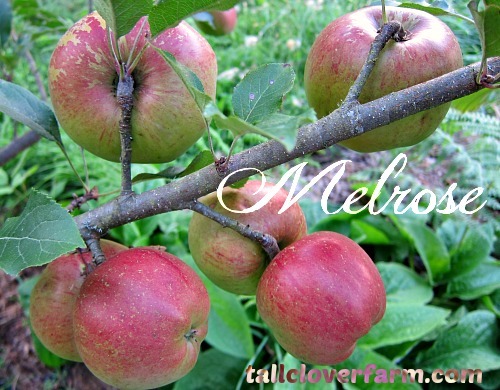 Melrose apple: I only planted Melrose a couple years ago, and it’s already one of my favorite apples. Dripping with juice and bright flavor, the crisp apples grow quite large and are perfect for fresh eating and baking. Introduced in 1944 from Ohio State University (and now Ohio’s official state apple), Melrose won kudos for exceptional flavor, but never took off commercially as consumers preferred prettier apples. Big mistake. This is a really great apple (a cross between the Red Delicious and Jonathan), which deserves to be more widely available. Plant one, you won’t regret it. York apple, a.k.a. York Imperial, is one of those apples that tastes like it should have a long history, and it does. With roots that run deep both literally and figuratively, the York apple was discovered in 1830 in York, Pennsylvania. Not overly sweet, York yields a subtle flavor and appealing, extra-firm texture. It’s an apple I could eat everyday. In addition, York is a superior baking apple, good-keeper and tree of exceptional vigor and productivity. 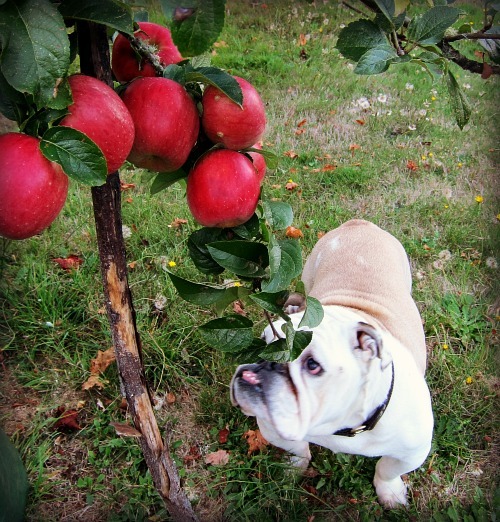 Jonagold was Boz’s favorite apple: low hanging fruit so juicy and crisp that a well-placed lunge would secure a sugary reward, easily crushable in one fell bite. I’ve ordered from all of these with complete satisfaction. I have a serious case of orchard envy, and one question–how many fruit trees do you have, all told? (I have none of my own on this property, but big plans for the next, boy howdy.) I confess to a real weakness for the apples in the white, silver, yellow, and gold spectra…those clear opalescent skins…but when I’m out and about buying apples in any quantity, I always grab what I can find of Northern Spy. Most likely I am favorably predisposed toward that variety because it was my grandmother’s favorite, and I can remember her saying 40 years ago that they were getting harder to find. Seems to still be the case today! But I live just south of the great New York State apple belt that runs along the southern shore of Lake Ontario, and know a few places where they’re still grown. We just bought a bushel this weekend. Wow Jacqui, never heard of some of these varieties. Don’t know how these apples taste, but their names certainly are delicious — Geeveston Fanny, who knew? I’ll have to a little more investigating; thanks for sharing this info. Cheers! Oh Tom, any chance of a list of names (apples and plums)? Always interesting to see or hear of the trees whether old or young especially how they fare when in fruit. I have caught the heritage bug. The US has such an enviable history with the malus. And I will be hopping over to Passions to Pastry for some apple inspiration! What’s better than a French Apple Tart! I have mostly heirloom fruit trees and agree that the Jonagold is an all around good apple of the modern apples. 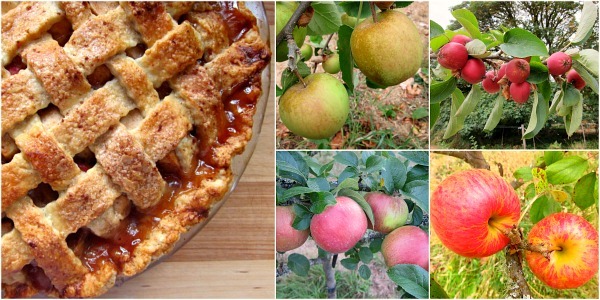 I also have Northern Spy, Gravenstein (Sauce), Yellow Delish, Bellflower (pie ! ), Red Delish that I got by default that gets made into juice because I prefer juicy, crunchy, tart, vinous, apples for eating. The prettiest apple I have is Pink Pearl which is worth growing. It is a golden yellow on the outside with a blush..and the inside is bright scarlet pink. It is very tart and has a very distinctive taste. It is good at peak ripeness but I also like it after it has been stored a while. The Yellow Delish I like for a mild, crunchy apple and it will not oxidize as fast as other apples so is good for salad and cheese plates. I also have heirloom plums and have just planted a modern plum called Emerald Beauty that is green on the outside, apricot color on the inside, deeeeeeelicious, and ripens late, in August so it extends the plum season. All of mine are semi-dwarf which makes it easier for me to prune them and also keeps the harvest bounty manageable..One of my favorite treats this time of year is an deconstructed caramel apple…Cut a tart apple into chunks into a bowl, add some really good caramel sauce, almonds, walnuts (or both) and munch…So good, and easier to eat than when it’s on a stick. You can add whipped cream also, of course. Hi Sal, holy apple pie, great information and findings! I’m eager to check out the Pink Pearl; and Yellow (Golden) Delicious is sorely missing from my orchard — a real apple star that is often overlooked. And per previous comments, it sounds like Northern Spy is another gem to plant. And Bellflower, wow, I like what I read: http://www.treesofantiquity.com/index.php?main_page=product_info&products_id=152 Thanks Sal! My grandparents purchased a piece of property in San Luis Obispo County back in the mid sixties that supported some three acres of apple trees. Enough where the orchard managed to take care of his property taxes each year. Lovely apples all – none of which I will ever taste (being on the down- underside of the world)… and a sweet memory of your/our dear Boz too. Thanks Janet! Apple trees should be blooming in your part of the world, while ours are ready for a long winter’s nap. Hi, Tom! Kim from Foxglove, here. 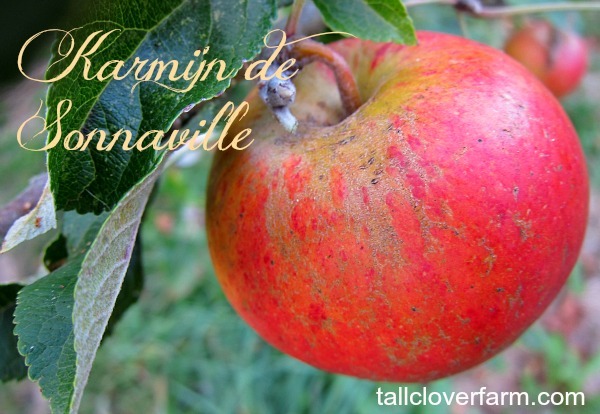 I had the pleasure of tasting a Karmijn de Sonnaville when I attended a cider making class at Finn River a couple of years ago. I knew I would have to include it in my orchard. Glad to hear it’s doing well for you. Thanks for sharing about your orchard. I only have a couple of acres, so my fruit trees will be small, but I hope to have as luscious a variety as you do! You are growing a marvelous variety at Tall Clover…do you sell your produce? I will be growing mainly for my extended family and friends, and hope to develop a market for any surplus. Kim, right now the orchard is young, but hopefully soon, I’ll have enough fruit to sell at the farmers market on in a stand. This is a cool website, no doubt. I feel I must leave a comment on this page too! I love fruit trees. I live in San Diego, but am planning to move up to Seattle soon, I’m thinking of Kirkland. Anyway, it’ll be so fantastic to have a whole new climate that allows me a lot of freedom with fruits like apples. Cox’s Orange Pippin is regarded by many to be the world’s finest fresh eating apple, and I would bet your climate is similar to that of the areas in England where it reaches its peak. You know, biannual bearing is a common tendency in fruit trees. You can offset it by thinning the fruit when they have just set. The remaining fruits will be bigger and better as well. We just planted our first crop of fruit trees…all different from these listed so I may have to check out some more varieties in future years! We put in a Northern Spy, Spartan and Honeycrisp. All from Burnt Ridge. Thanks for sharing your experience! Tom are you growing full size trees, or using pruning or rootstock to keep small? I read a great book, Grow a Little Fruit Tree, by Ann Ralph. Have you read it? She recommends pruning to keep the tree to a manageable size, and to choose rootstocks for disease resistance. She has written some interesting pieces about allowing your tree to root over the rootstock, and how different rootstocks may impact the flavor of the apple. Good stuff! Hi Kim, First of all thanks for sharing these great resources, I’ll check them out. As for rootstocks, I’m a little remiss is using too many semi-dwarf rootstocks. While my trees have remained easily manageable, I’d prefer them to be a bit more robust in the growth department. All are quite easily manageable sizes, though a couple new trees are showing unexpected and welcomed vigor; the Spitzenberg, Calville Blanc, and Hudson’s Golden Gem. I plan on planting a full size Bramley’s Seedling this year. That apple is too good to only have a small tree, and plus mine tends to be a biennial producer. It’s New Year’s Day and I’m pouring coffee while poring over a few online sources for bareroot fruit trees. I love my orchard and the pursuit of finding new and old varieties is part of the fun and the reward. Thanks again Kim, happy growing! I’m really perplexed about whether or not to go for the larger/full size trees. You wait longer for fruit, but get a longer, more robust fruiting life. Of course, espaliering or other forms of severe pruning (like Anne Ralph suggests) would bring fruit on faster, but do I want that much labor? Then again, I may have my choices made for me, if all I can get are trees on dwarf or semi-dwarf stock. Kim, I’d say go with semi-dwarfs if you want several varieties. Just stay away from truly dwarf trees (need big support, topple easily). With SD, You can plant more and plant closer together, and then have a wonderful medley of great apples. Variety is the spice of life or orchard, as the case may be. And the more I think about it, I prefer variety, more than a large crop of one or two apple types. If you live in an area with irrigation or regular watering, they’ll thrive. My orchard is not irrigated so Puget Sound’s dry summers can really take a toll on vegetative growth of the tree. I do use trunk water bags when the young trees look stressed. I’ve been so happy to find your blog. I appreciate the advice, and it is always a pleasure to read. Any advice on sweet cherry varieties? Oh, don’t I know! My grandfather had a Bing cherry tree over 40′ tall! He had another, more manageable, but we still had to climb in it to get our share! Stunning in spring, an absolute mess in summer, he finally cut it down, and the stump was over 2′ across. He put pots of fuschia on it. I love cherries, and don’t want to share. Thanks Elissa, I’m going to do a follow-up this year as I’ve have more trees coming into production, and I’ll share some insights about those.